With the baby product manufacturing industry expanding rapidly, HKTDC Hong Kong Baby Products Fair, which made its debut in 2010, is growing up fast, too. Entering its 3rd edition, the event will continue to connect global baby product manufacturers and suppliers with the booming market. In 2012, over 350 baby product manufacturers and suppliers are expected to participate in the fair. The Hong Kong Baby Products Fair will be held from 9 to 12 January, 2012 at the Hong Kong Convention and Exhibition Centre. The impressive growth in attendance proves the success of the fair, with 25,366 buyers from 122 countries and regions in 2011 representing a 22% growth over 2010. In 2012, over 350 baby product manufacturers and suppliers are expected to participate in the fair. The upward trend is expected to continue, considering the rapid expansion of the baby product industry as well as the rising popularity of the fair with global baby product manufacturers, suppliers and buyers. There has been extraordinary growth in the emerging markets such as Brazil, Chinese Mainland, India and Russia for baby products over the past few years. Participants in the Hong Kong Baby Products Fair 2012 can gain access to these markets of staggering potential. In 2012, the fair will be zoned into different categories for buyers to target baby product manufacturers and suppliers offering relevant products. Product zones include Bedding & Furniture, Feeding, Nursery & Maternity Products, Baby Gift Sets & Souvenirs and Toys & Activity. Two zones are worth particular notice: Brand Name Gallery and Eco Toys & Baby Products Display Area. The Gallery assists baby product manufacturers and suppliers to build brand image as well as attract attention by showcasing high quality products in any category. The Display Area focuses on products with ecological credentials through the production process or materials used. Following its success in previous fairs, the Hong Kong Toys & Baby Products Award will return with additional awards in two toy categories. The winning pieces will be showcased at the fairground throughout the fair. Winners will also be invited to conduct a session to share the concept behind their winning entries. Buyers also have access to up-to-date information through seminars which cover development & procurement trends for baby products, global safety directives and eco-sustainable design. 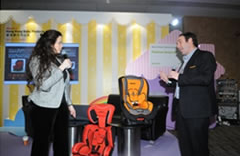 Product Demo and Launch Pad sessions allow exhibitors to promote their baby products interactively to buyers. Events such as these enable buyers to learn the latest baby product market trends and to exchange ideas with counterparts from around the world. Three concurrent fairs will be held at the same venue: HKTDC Hong Kong Toys & Games Fair, HKTDC Hong Kong International Stationery Fair and HKTDC Hong Kong International Licensing Show. The toys & games event is the largest fair of its kind in Asia, drawing a record-breaking 34,000 buyers last year at its 37th edition while the stationery fair welcomed more than 15,000 visitors last year. These four fairs offer multiple possibilities in sourcing, networking and new business partnerships. The synergistic nature of the fairs delivers crossover sourcing opportunities from a vast array of products presented by over 2,600 exhibitors.